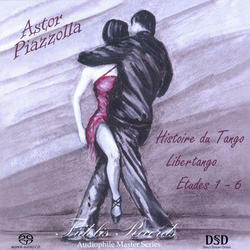 (SACD-HYBRID) The music of Astor Piazzolla epitomized our situation in the modern world with his fusion of folkloric beauty and contemporary tension. In recent years, Piazzolla has taken the new tango back to the concert halls, composing and performing works for chamber ensembles like Kronos Quartet, larger groups like The Orchestra of St. Luke's, even an opera company. These works brought his once radical music back into the mainstream. Histoire du Tango, for violin and guitar, contains four movements charting the development of the form at 30 year intervals. The interplay between the two instruments, which is often sprightly and joyous, makes this an accessible and interesting piece of music. Recorded Live, Direct-To-Master using Tube Equipment. Extraordinary Dynamic and Lifelike Sound. Fidelis Records Audiophile Master Series.